Practicing business law in Houston since 1977. Started with a big firm, then formed my own small firm in 1993. 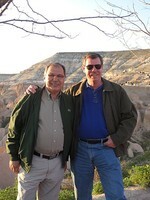 Just got back (May 2009) from 2 weeks in Turkey visiting Nabi Cerit, our WHS 1970 foreign exchange student from Istanbul. William "Bill" Ogden has a birthday today. William "Bill" Ogden has a birthday today. New comment added.